And once again the 20th of the month rolls around, and that means another big party here at Ferreira Fest where we celebrate the acting career of Louis Ferreira (Justin Louis) and his friends and check in on our charitable causes and mentorship work. This month we have an exclusive interview with Eric Banerd, the Motive Season 3 opener, photos, Q&A, the big Birthday Project wrap-up and a homework assignment for all of us! Grab an age-appropriate fancy pineapple cocktail at the bar and come on in - let's polish off those birthday cake leftovers! The Corsage Project, working in partnership with the Children’s Aid Foundation, is a non-profit program in Toronto dedicated to giving the authentic prom experience to young women and men who would not otherwise have the opportunity to celebrate with their peers due to the high cost of formal wear. Through the scholarship program, the Corsage Project also helps local high school graduates achieve their post-secondary goals. Check out the official newsletter of CAF: The Buzz - the February issue can be found here. Click on the banner below to donate to the Children's Aid Foundation. If you choose to make a donation to The Children's Aid Foundation The Friends of Louis Ferreira will send you a small Louis-related gift. Donating is easy and donations are tax-deductible. The Good Neighbours' Club in Toronto has made several posts this past month. The club members are in desperate need of towels. It has been extremely cold in Toronto this winter and we all know how good a nice hot shower feels. If you live nearby please drop off some towels at GNC or make a donation below. Join the folks who have generously donated towels already! At their recent Board meeting GNC honored their past chairs. And we got a #FollowFriday shoutout from The Good Neighbours' Club! If you'd like to contribute to the towel fund or any other needs of The Good Neighbours' Club, please click on the banner below - the donation process is quick and easy, and all donations are tax-deductible, and of course we will also send you a small gift as a thank you! Louis is a regular supporter of Project Limelight, a children's art organization in Vancouver. Here he is with the kids and with co-star Adam Greydon Reid after participating in one of their recent film projects, a short film called The Review. The Review screens on March 22 at 2pm in Vancouver, at Simon Frazier University's Goldcorp Centre for the Arts, 149 W. Hastings St. If you're in the area this weekend don't miss it! Project Limelight – the busy non-profit that provides valuable performing arts opportunities to Eastside kids – presents a special afternoon screening of its short film, The Review. Directed by Michelle Ouellett (Afterparty), the short stars the Project Limelight kids and a bevy (or is it a gaggle?) of local film & TV industry pros, including Louis Ferreira (Motive, Breaking Bad), Erica Carroll (Supernatural, When Calls the Heart), and Adam Greydon Reid (Gracepoint, Continuum). Watch for a special live presentation by the Project Limelight performers. 2pm, March 22 at Djavad Mowafaghian Cinema at SFU Woodward’s (149 West Hastings). Project Limelight invites you to our short film, THE REVIEW, on Sunday March 22nd. from Project Limelight Society on Vimeo. Watch this space for a special feature about Project Limelight in Ferreira Fest 64 next month! 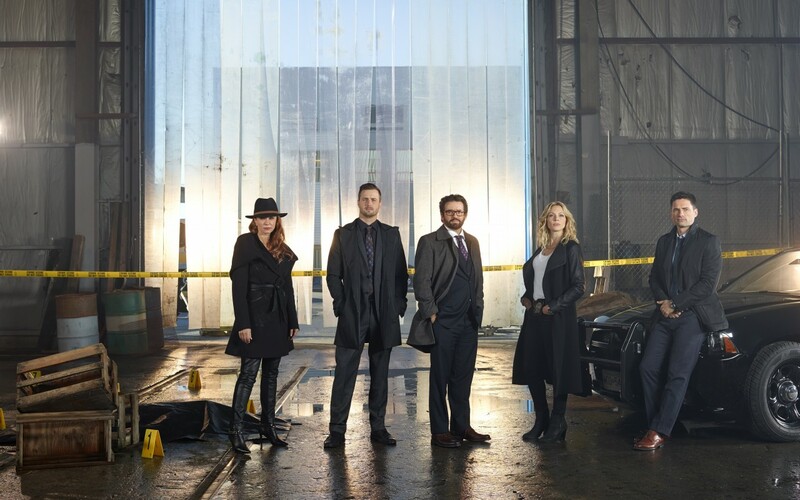 MOTIVE's Season 3 is finally on the air! Alas, there is still no word about who will pick up the series for their summer lineup (ABC will not pick it back up). Meanwhile people in Canada can enjoy the new episodes while the rest of the world has to bide their time. But here are a good number of online articles, photos and tweets about the first few episodes! Hopefully MOTIVE's ratings will remain high and entice networks elsewhere to pick up the series. The Vancouver Sun’s Francois Marchand visits the set of CTV crime show Motive, shot in Vancouver, for an exclusive look at Season 3 and interviews with the stars. The homegrown crime drama begins its third season on a new night, six months after the dramatic events of the Season 2 finale. Check out an exclusive preview of one of Motive’s stunts in photos! Who's the man with the fire extinguisher? Vega will have some battles ahead as he will face a crisis that not only threatens his career, but his personal life as well. Kristin Lehman leads the returning ensemble cast for a third season, including 2014 Leo Award-winning actor Louis Ferreira, along with Brendan Penny, Lauren Holly, and Warren Christie. Bellmedia - high resolution cast shot on location from article above: download now! Bellmedia - A press release in pdf form with a great Oscar Vega photo - download now! Thanks to Agi for the links! There were countless others but they tended to be quoted or copied from the articles above. For the past half year Louis participated in a young artists mentoring program called FYA - Fulfilling Young Artists, and he was asked to mentor a young actor and musician named Eric Banerd. Here's how he got involved in FYA. Eric was kind enough to do an exclusive interview with The Friends of Louis Ferreira for this month's Ferreira Fest. Genuine is another good one, too. He’s genuine, loving. When he goes into a room, he can change the room. And when you see him, like I got to go to set, to see him on set, he can change the vibe of someone. Hang out on his Web Page. Check him out on IMDb. Watch his reel on Vimeo. Please visit Eric's Page here at The Friends of Louis Ferreira! After a year on the Festival Circuit, Pauline Egan's short film starring Louis Ferreira is still wiping the floor with the competition! The latest win was at the Legacy Filmworks Awards which was held March 6-9, where Through The Pane won 1st Place! Congrats, Pauline, and way to go! Watch this space for an exclusive interview with Pauline Egan later this year! Here's a really old photo posted by Edunio Silva on his Facebook page. Thanks for sharing, Edunio! Behind the scenes of shooting MOTIVE Season 3, hanging out with Kristin Lehman. This photo was taken on the balcony of the condo where the crime scene was located in MOTIVE Season 3, episode 2 "Calling the Shots". Louis tweeted before the Motive Season 3 premiere. And this Tweet has a short video clip of Louis! Thanks, @MotiveTV! Legendary filmmaker Albert Maysles died two weeks ago. Albert and his brother David became famous for their unconventional movies which inspired a whole new way of making documentaries. Read a press release here. From Wikipedia: The Maysles Brothers have shot over 30 films. Their films Salesman, the Rolling Stones film Gimme Shelter, and Grey Gardens are considered examples of Direct Cinema. Albert Maysles said: "Remember, as a documentarian you are an observer, an author but not a director, a discoverer, not a controller." Albert pioneered the "fly on the wall" perspective in documentary cinema. His success from a technical aspect was based on separating the camera from the sound recording device (David used a Nagra) by accurately controlling the speed of the camera and the tape recorder allowing the two devices to be moved independently with respect to each other; an impossibility in commercially available equipment at the time. Long takes with ordinary equipment of the era would invariably lose synchronization. In May 2002 the New York Times referred to Albert as "the dean of documentary film making". Two of their films, Salesman and Grey Gardens, have been preserved in the Library of Congress' National Film Registry. In 2009 HBO released a movie about the making of the Maysles' documentary of Grey Gardens. Louis played David Maysles, Albert's brother, who was the sound engineer genius half of the film maker team. Louis has fond memories of making this movie. FF – Here’s a thing that also happened. Did you hear that Albert Maysles died? LF – Yeah, I just read that like four days ago. Did I play Albert or David? FF – You played David. You played the brother. LF – David was already, had passed away. FF – Yeah. And now Albert is gone too. FF – Oh, what a shame. Grey Gardens is one of my favorite movies. It’s just phenomenal and so wonderful. Do you remember making that? Was that filmed in Toronto? LF – Yeah, we shot it in Toronto, it was during that period where I was kind of stuck there. When I was like, I can only take jobs in Toronto, and it was a gift that came through. And I auditioned and I remember, I was such a big fan of Jessica Lange as a younger actor, I thought, as far as actors, it was her and Meryl Streep, those were my two queens of acting, and so seeing her act and being around her was like a real treat. And then Drew Barrymore, it was interesting to see Drew because she’s usually the cute girl, the quirky next door friend type of thing, and she was really pouring her heart and soul into her character, she stayed in character the entire time. And she introduced herself to me at the wrap party. She said, “I’m Drew.” Up until then she was Little Edie the entire time. LF – So, it was nice to see her method-act. And she had a vocal coach through the entire time who was there, and it was nice because of course there was a little flirtation between my character and hers. You just were happy to be part of that kind of project, and then it went on to win, didn’t it win eight Emmys or something? FF – Oh, yeah, it was huge. LF – It won a lot of Emmys and so it was just a nice feeling to be part of that kind of… that’s one, as an actor, when you get those, those are the homeruns, and for me it’s never been about, just to be part of something like that where you’re just grateful and you’re like, wow, it’s a nice feeling when you’re in a film that so many people love and respect and that gets that kind of accolades. So, I remember it well, I remember enjoying my experience very much. Again, I got to be a fly on the wall, as we, in fact, were the documentary filmmakers making - it was "the making of the making of", so, we got to watch them act. So, a lot of the times we were the ones recording, pretend-recording, and filming and recording sound. But you saw very little of us, but we were there for a lot of it. LF – Which is also great. FF – I’d seen actually the Grey Gardens version first, and then I watched the original documentary afterwards. And it was amazing, the overlaps and just the care that went into the historical research that they had done. And to replicate the situation and the looks and even the fabrics, it’s just amazing! LF – Yeah, they did a great job. It was definitely a cool piece, I was very happy to be a part of that. FF – I was wondering, also, how different is it when you play a character that is entirely made-up, such as Colonel Young or something vs David Maysles who, at the time, was still alive, right? When you filmed it? LF – No, I think David was already deceased. FF – David was already dead? LF – I think so. I knew one of the brothers, I feel like, was already passed. So it must have been David, if Albert just passed. Yeah, it’s always interesting. The weird thing is, a lot of times you’ll take liberty with it. When you’re playing a real person, I feel for me it’s like you’ve got a lot more advantages because you’ve got so much more to go on. There’s a sound, there’s a look, there’s a history, there’s a life. There’s real stuff, whereas if you’re creating something, it’s great in the sense that you are the one creating it, but at the same time, a lot of times it’s explorative in that, as you’re doing it, more and more is revealing itself. As opposed to, when I got to play, for example, the Trump thing, I had a whole history and a biography and a sense of everything about him. It feels like it’s an advantage only from the perspective of having information more at your fingertips. FF – Right. The background, yeah. LF – It makes a difference, as opposed to, because the fictional ones, you’re creating the background. LF – You know, with Colonel Young I had to imagine him. This is his childhood. This is how he got into the military. This is why. Why is he hard and cold and stern? You know, all that stuff, that’s all coming out of your own, you do that kind of work, and that’s just as fun. It’s different, I don’t know, they’re both challenging, just in different ways I guess. To commemorate Albert Maysles and his brother David who died in 1987 we have 339 screencaps from the HBO movie for you this month. Please be sure to watch the actual movies - they will be well worth your time, and these iconic all-star classics don't lose their appeal even after repeated viewings. This month we have a question from Brian. FF – When I was reading the Song of Ice and Fire books, I pictured you as Prince Doran Martell. At any point, were you ever up for the part, or had you considered trying for a role in Game of Thrones? Alexander Siddig is a great actor and I’ve seen him in a few parts. He should do fine in the role, but I still think you would have been better. LF – Well, thank you very much. The answer is no and no. Very, very sweet of him to say. I will take that, and say thank you to that! Thanks for the great question, Brian! Got a question for Louis? Please send it to ask_louis@louisferreira.org. It's been a while since Louis gave us all an assignment, but here we go: inspired by his memories of playing an actual historic character Louis wants to know which actors playing historic characters you like. LF – I want to know people’s favorite biographical performance by an actor of somebody else. And I will say that I just love the kid who won best actor for The Theory of Everything, Eddie Redmayne, for playing Stephen Hawking. He’s brilliant. So that’s my contemporary choice. I love Jim Morrison in The Doors. And I love Jim Carrey in Man on the Moon. I feel like this is what it is? The Andy Kaufman one. He was brilliant. Yeah. But those are my three off the top of my head. I’m sure there’s others but that’s a great question and have people come in with their answers. I want to know who - that’d be fun! Please leave your answers at the special topic thread in the Forum. Not a Forum member yet? Joining is easy and free, and nobody will pester you or send you spam since we own the site completely! Click here now to sign up and join us! I will send everyone's response to Louis next month so we can compare notes. Please join us and respond to Louis' request! When the Munchster and I come to a fence that he can’t climb, he squeezes under it. In olden times people had a high value on humility. If you’re too puffed up you can’t get through a lot of openings. If you’re willing to be flexible, you can get through lots of spaces that an arrogant dog couldn’t. Hi there -- Lots of fun things coming! Lizzie Borden starts airing in April on Lifetime and Thai-Sanity is almost finished, which will then be another exciting adventure of its own! Please visit Bradley's Page here at The Friends of Louis Ferreira! Tagline: After inheriting half of a house, a young woman develops an unexpected friendship with her co-owner. Please visit Peter's Page here at The Friends of Louis Ferreira! Please find out more at Rob's Page here at The Friends of Louis Ferreira! Jen has been busy filming the Sci Fi short film The Adept. Check it out on Twitter. And finally, a great shot from one of Stargate Universe's most memorable episodes: Season 2's "Epilogue". Here we see Jen in her old-age makeup. Still fabulous!! Jeff Cathrow's Declan Series of his Breaking Bad location photography has been updated with lots of new fabulous pictures, and there is new Declan-themed artwork as well! Check out Jeff's Page and art gallery here at The Friends of Louis Ferreira. Here's a cool picture of David performing which appeared in The Colonnade, Georgia College's student newspaper. The Dance Performance for which David wrote some of the music, "Body: How Truth Moves" took place earlier this month to sell-out crowds. Congrats, David! Visit David's Page here at The Friends of Louis Ferreira! Chance has posted four new poems. Click on the thumbnails to see the full text. Check out Chance's Page here at The Friends of Louis Ferreira! There's only MOTIVE on Hungarian TV now, and it's only on TV2. It's on Thursday night at 11:35pm. Also, Saw IV will be on Film Mania on the 20th at 10:55pm. Apart from these, there's nothing else Louis-related in Hungarian TV. Not a very exciting month I'm afraid. Thanks for keeping us in the loop, Ildi! Last month Louis' IMDb file pushed back into the Top 5000. It was right around the time when all the press releases about MOTIVE Season 3 started coming out. It's been a while since we've featured the Wikipedia hits page for Louis. Here is a screenshot of a recent one. Which day do you think was the Season 3 premiere for MOTIVE? Alma writes: Did you ever watch the videos of the llamas being chased in Arizona? They're weaving between stand-still traffic while people try to catch them. Vicky, who is 4 years old, saw it and said "Elmer says no playing between cars." I guess Elmer's still teaching kids about safety... but not llamas! Know any young kids who could use some traffic safety training that's fun and potentially life-saving? Check out our Elmer Page - we have booklets, flyers and Elmer's Safety Song for kids of all ages! Thanks to everyone who sent in a birthday card for Louis. The package was sent straight to Los Angeles where Louis enjoyed unpacking everything and reading your notes. that were sent to Louis this year. And here is Louis with one of them. And here's Louis with a message for everyone! A big thank you to all my friends! I am so grateful for the birthday wishes and the birthday love, and I send it right back in the form of every happiness to all of you. I was truly humbled and felt very, very loved, and so a big, big thank you to you guys! A week earlier Louis' Vancouver friends threw a surprise party for him at the Blue Water Cafe. Here is the birthday cake with the wonderful old photo on it. Thanks for keeping us posted, Pauline and Jackie! Finally, we welcome a new staff member to Ferreira Fest! Margo will work on archiving all the various news articles that we link to in each Ferreira Fest. Many of these articles and columns disappear within days; links break, websites go defunct. Thanks to Margo, those articles that are still out there will be available for you to download through an external site. Please watch this space for news about this project. Welcome, Margo! You may contact Margo at margo@louisferreira.org. All of our staff member can be reached via email through our CONTACT page. We are always happy to hear from you!